BBC Worldwide is to launch its first ever shop devoted to Doctor Who at the much anticipated Doctor Who Experience. The shop will be a treasure trove for fans showcasing Doctor Who toys, games, books and licensed merchandise. Designed, staffed and managed by brand experience and retail specialists Brandnew Corporation, it is the first time BBC Worldwide has created a stand-alone retail operation dedicated to a single television brand. The shop will open on 20th February in tandem with the Doctor Who Experience and remain open throughout its run. The Doctor Who Experience will be further supported by a Wi-Fi service exclusive to Olympia. Also provided by Brandnew, the ‘closed loop’ mobile Wi Fi platform is dual purpose – while receiving redeemable coupons for use in the Doctor Who shop, visitors can also use smartphones to enjoy an immersive browsing experience related to the aliens, monsters and storylines at the show. It is the first time an event at Olympia has used Wi Fi to enable mobile content to be distributed this way. The Wi Fi service has an easy login interface and one click access to content. From a special offers area, users download promotional barcodes which are then swiped at the checkout reader in the usual way, with price reductions shown at the till and on receipts. The wireless service is security encrypted and much faster than any 3G network. Much of the material for download is exclusive to the Dr Who Experience with a wealth of facts, figures and information. A special subtitling service can be accessed for the deaf, ensuring the Experience – led by the Doctor’s own vocal commands – is just as meaningful. The shop will retail over 400 Doctor Who SKU’s at any one time, with many items exclusive to Olympia – a showcase of licensed product larger than anything available on the high street in one place. The Doctor Who shop is a stand-alone outlet adjacent to the café, though most visitors will enter after enjoying the Experience and Exhibition. The 133 square metres has a circular layout to encourage easy and full navigation of the merchandise. The tills and checkout area at the centre mimic the central console of the TARDIS. The brief from BBC Worldwide was to create a retail extension of the Dr Who brand experience. The Doctor Who Experience promises to be a spectacular event, featuring an exhilarating walk-through adventure, where visitors can step into a full recreation of the Eleventh Doctor’s TARDIS, and an ‘out of this world’ exhibition featuring iconic Doctor Who props and costumes from its 47 year history. This is the first ever fully immersive Doctor Who attraction - an unprecedented opportunity for fans to step through a crack in time and take part in their own Doctor Who adventure in the role of the Doctor’s companion. Their challenge will be to reunite the Doctor with the TARDIS whilst facing some of the best-loved and most-feared monsters from the hit series, including a Dalek spaceship and Weeping Angels. Brandnew Corporation is responsible for the full retail offer at the Dr Who Experience; designing the interior and layout, determining the fixtures and displays, setting up the till and EPOS systems, product ranging and merchandising. The company is also tasked with the live customer experience; recruiting, training and briefing staff for the interactive show, exhibition and shop, plus stewarding at the event itself. 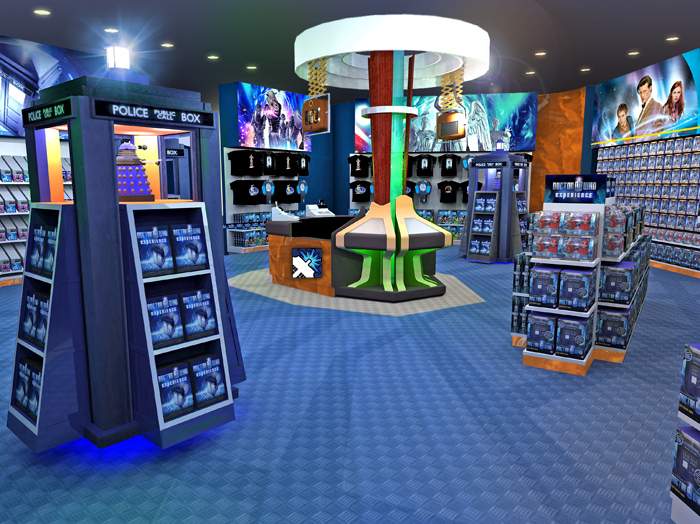 Doctor Who Online have access to a large version of the shop interior image, which you can view to the right. + The Doctor Who Experience runs at London’s Olympia 2 from 20th February 2011.